The Ministry of Education and Science (and the media reporting the news) is spinning it as “good news” that radioactive materials detected in river water and well water in Fukushima Prefecture are “far less than the provisional safety limit”. If you compare the level to the one before the Fukushima I Nuke Plant accident, it is a different story altogether. The highest strontium-90 level in the Ministry’s survey is 5.14 times the highest level measured in 2009, and the highest cesium-137 level is 6,500 times the highest level measured in 2009. The Ministry’s announcement (10/20/2011) is here (in Japanese, PDF). The Ministry did the survey twice in June and August. It selected the survey locations from the areas that showed relatively high level of cesium deposition in soil in the Ministry’s aerial survey after the accident. 50 river locations and 51 wells were selected. Radioactive cesium and iodine-131 were measured in all 101 locations. Strontium and plutonium were measured in 10 river locations where the air radiation was high. Similarly, at 6 wells, only strontium was measured. According to the Ministry of Education and Science, “Radioactive materials in both river water and well water are far below the provisional safety limit of 200 becquerels/kg”. 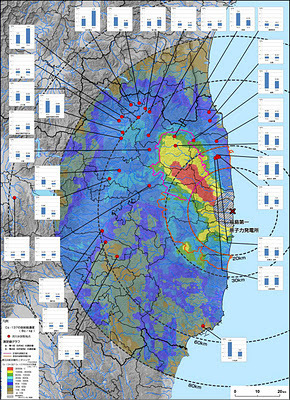 However, according to the Ministry’s national survey in 2009, the highest level in river water was found in Akita Prefecture at 0.00037 becquerels/kg (ND in Fukushima). So, 2.0 becquerels/kg of cesium-137 detected this time in Fukushima is 5,400 times as much as the highest level in 2009 in river water. As to 1.1 becquerels/kg of cesium-137 from the well water, it is 6,500 times as much as the highest level detected in tap water in 2009. According to the Ministry’s calculation on the internal radiation if one drinks the river water that had the maximum amount of radioactive materials for one year, cesium-137 would result in 0.025 millisievert, and strontium-90 in 0.00049 millisievert. The detection limit for the Ministry of Education’s survey was meaningfully low. For radioactive cesium and iodine-131, the detection limit was 0.1 becquerel/kg. For plutonium, it was 8 x 10^-6 becquerel/kg (0.000008 becquerel/kg), strontium-89 at 4 x 10^-3 becquerel/kg (0.004 becquerel/kg), and strontium-90 at 6 x 10^-4 becquerel/kg (0.0006 becquerel/kg). Why aren’t more people involved in finding the real truth behind this debacle? Changing the standards doen’t solve a thing. Rice and tea from Japan is ruined. Here in CA, we have found plutonium in the strawberry and other soil. Unless something is done to fix this mess, we will all die.